Roasting eggplant on tawa or skillet when we were in India was as easy as pie, but my first attempt in doing the same here got me butterflies in my stomach. The fire alarm at the slightest insinuation of smoke started emitting an earsplitting sound which I conceive might awaken a dead man from his sleep. The entire house resounded with the deafening noise three times at a stretch after which I felt I have had enough and began to roast the eggplant in oven. It was quite a scene!! 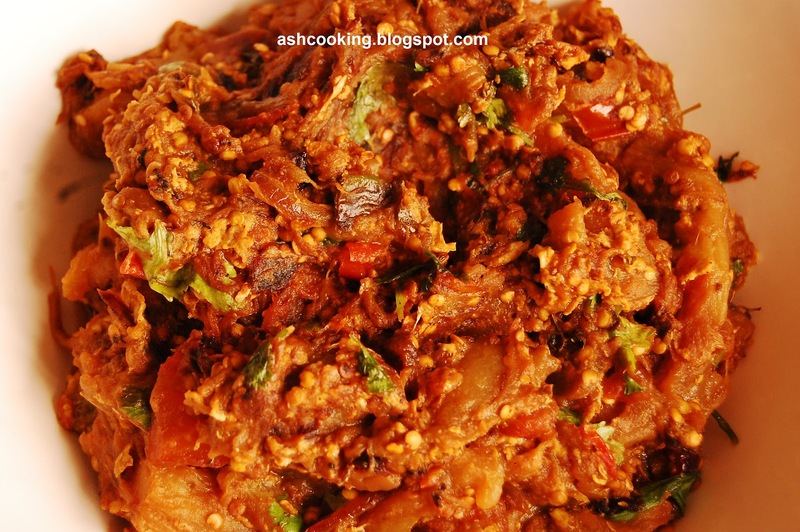 Dim Begun is another variation of the traditional Baingan Bharta. Every step required in cooking bharta is followed in conjuring up Dim Begun with the exception of breaking an egg at the end. In fact, it is so similar that two of the snaps attached demonstrating the method of roasting the eggplants have been copied and pasted from my Baingan Bharta entry. 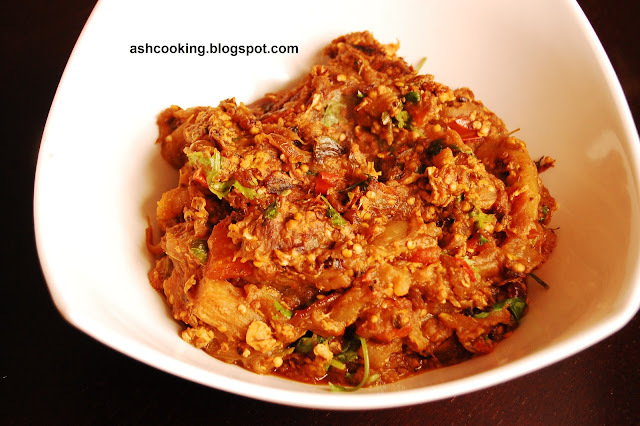 Just let me know how you like the Baingan Bharta with egg. 2) When they are roasted on all sides with a sweet burning smell of eggplant permeating the air, take them off the flame and remove the husk. 4) Heat the oil in a frying pan. Add the chopped onions and tomatoes and fry them till they turn translucent. 5) Then add the mashed eggplants along with green chillies. Add 1 tsp of turmeric and salt. Fry the eggplants on low or medium heat thoroughly, stirring sporadically. 6) When the eggplants would become brownish in color, break an egg in and quickly stir in to mix. When egg is cooked, turn the heat off. Garnish with coriander leaves. 7) Serve hot with roti or chapati.